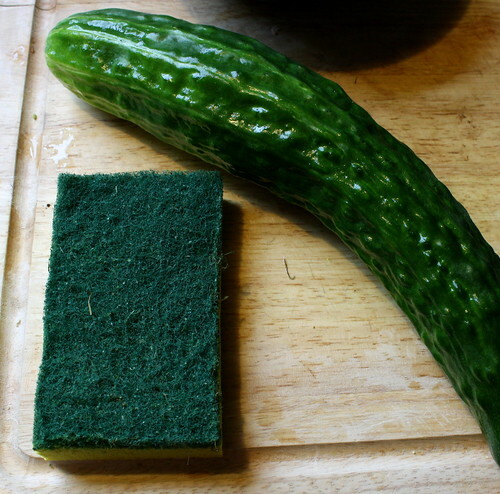 In our last episode, we saw A Giant Pile of Cucumbers. 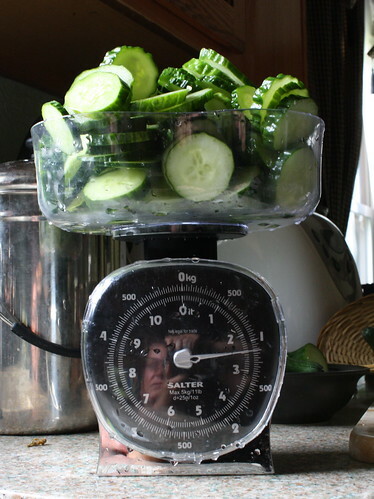 All told, it yielded about six pounds of sliced cucumber – with another 2.5 pounds left untouched. 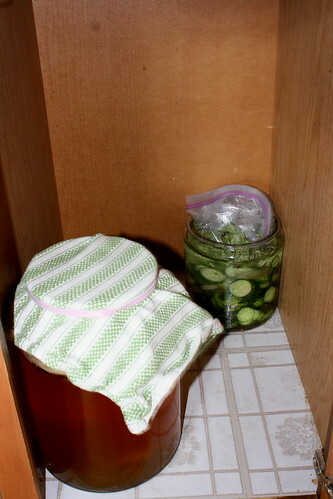 I officially have 6 pounds of pickles in the works people. 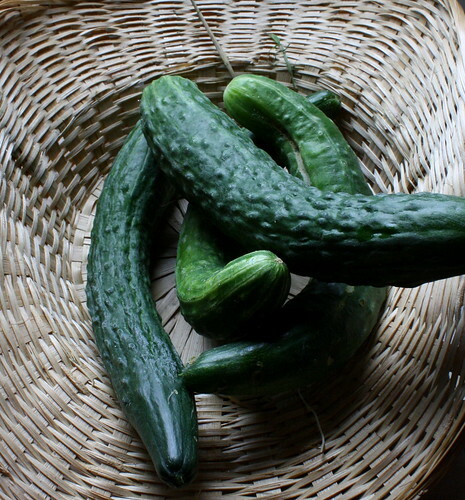 I also have a few cucumbers to give away. No promises on ripeness perfection, because, not being much of a cucumber fan myself, I have no real clue when they are fully ripe. 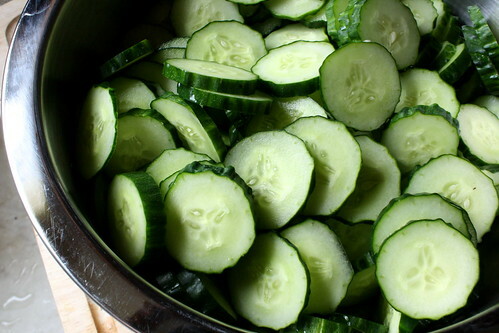 Also, I can already tell the word “cucumber” is going to look like utter gibberish after about two more paragraphs. First, please accept my apologies for the flat, lifeless light in my kitchen on this cloudy day. The one window doesn’t really make my camera or its subjects very happy, and I didn’t feel like taking the time to haul things out into the sun room when I wanted a photo. 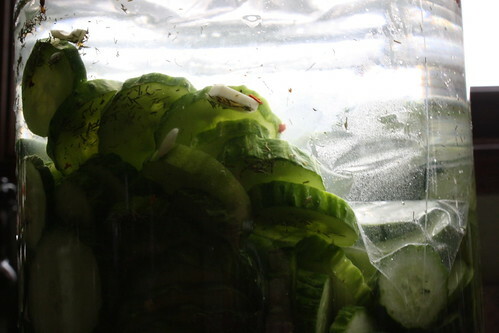 Second, before any pickling could be done, I had to get rid of the OMG thorns on these suckers. Turns out, a fresh kitchen scrubber does the job very, very well. 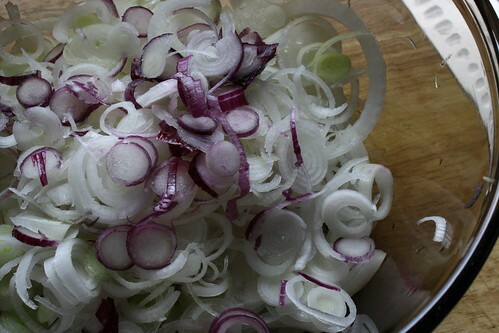 Then, The Slicing began. My knife skills are largely sub-par. 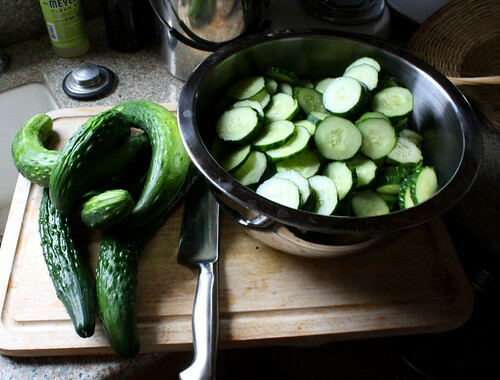 It took a long damn time to slice up nearly six pounds of cucumbers and one pound of onion. 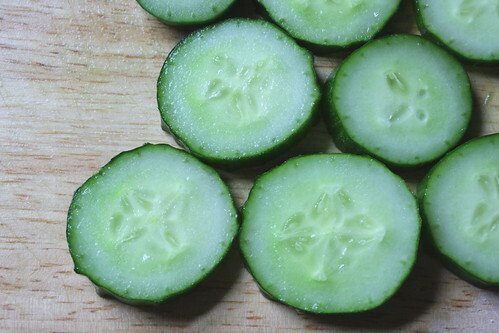 The inner workings of cucumbers (yup, there’s the gibberish; it looks utterly nonsensical) are quite elegant. The symmetry of nature astounds me once again. I’m sure you’ll all sleep better tonight knowing this. 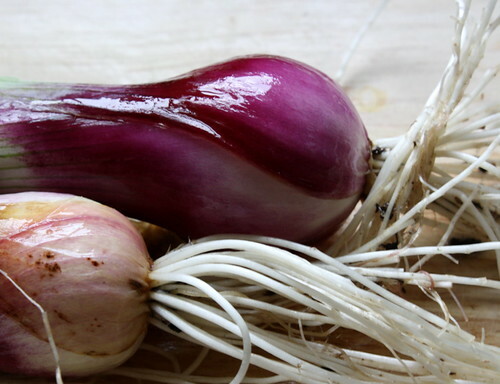 I found myself a half-pound light on onion. Boo. 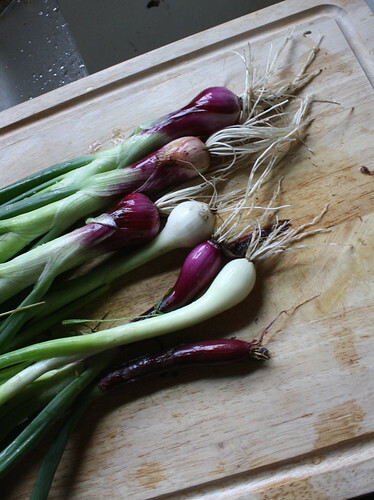 The garden onions are nowhere near mature, but I went and yanked several out, anyhow, because there are many out there in various stages of development. Even though they’re tiny and young, they surely are pretty. Into zillions of tiny pieces they went. 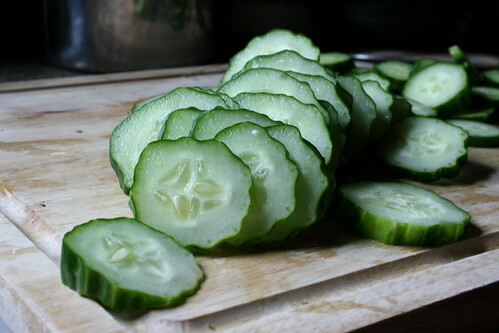 After mixing them up with the cucumbers, I had to do something that goes against everything I stand for. Something unforgivable, but apparently necessary. When I was in my early adolescence, I gave up adding salt to my food for Lent. It stuck, and I nearly never add salt to anything anymore. Mike Neir, on the other hand, is a complete salt hound. To appease his palate, I have been adding salt to some dishes, hoping his arteries don’t crust up as a result. Unless one is Antoni W., the only person I’ve ever known who was diagnosed with a sodium deficiency, one just doesn’t need to add salt to our Western foods – there’s plenty manufactured right in. More than plenty. More than enough. More than Way Too Much. It should be criminal, how much salt gets into our foods. After mixing things up, I covered them with this fabulous kitchen towel Mike’s mom, Sharon, gave to me, put a bunch of ice on top and stuffed it in the fridge, where it will sit for two more hours. 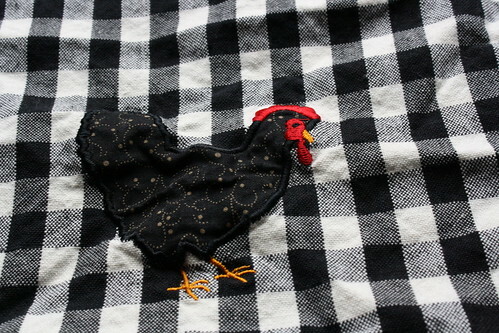 I wasn’t thinking ahead when I started this project at 3:30pm, honestly. 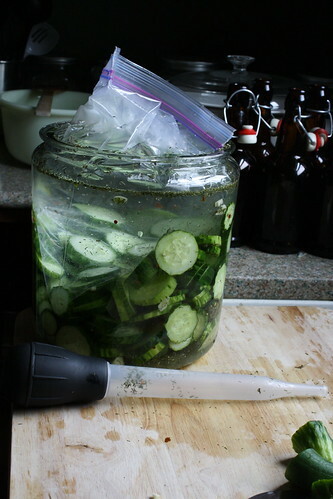 The dills I made for Mike were complete easy mode – throw aromatics, cukes and brine into a one gallon crock, cover and wait four to seven days. I was using Alton Brown’s recipe for dills as a base, but I added a few things and used slices instead of whole cucumbers. 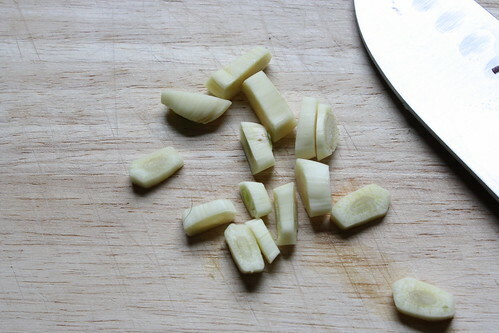 Sadly, I only had three good cloves of garlic – the rest had all shriveled up and died. 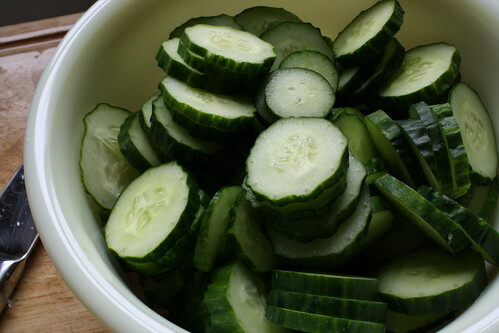 We already had about three pounds of cukes, sliced. 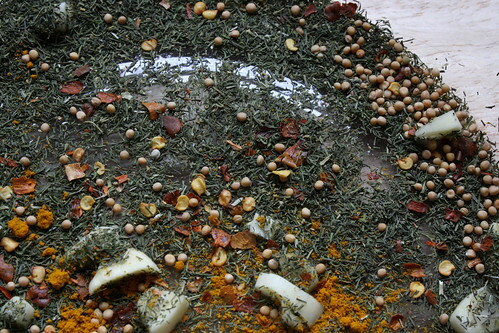 I tossed the aromatics into the bottom of a one-gallon glass jar. 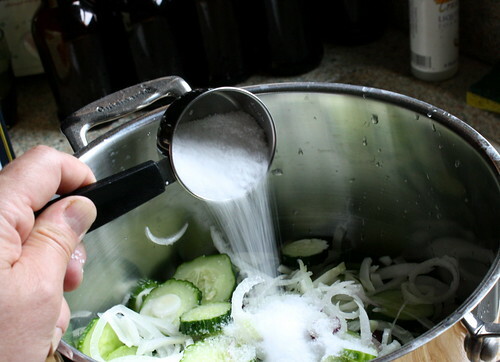 In went the cucumbers and a very salty brine – twice as much salt as for the bread and butters, and this stuff won’t end up getting rinsed off. 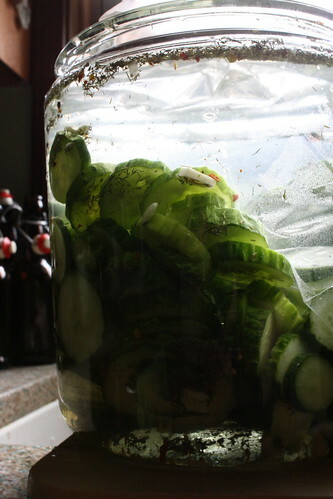 It’ll percolate into the pickles. I think I just heard Mike Neir drool. 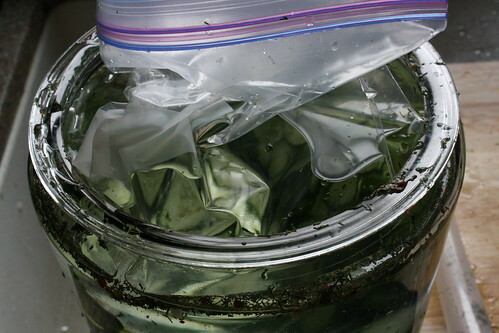 Next, we simply fill up a freezer baggie with the remaining brine and shlop it down on top of the pickles and brine to ensure everything is completely sealed. You might think this is a simple operation, but for me, it was the lengthiest part of the ordeal – apart from the slicing. 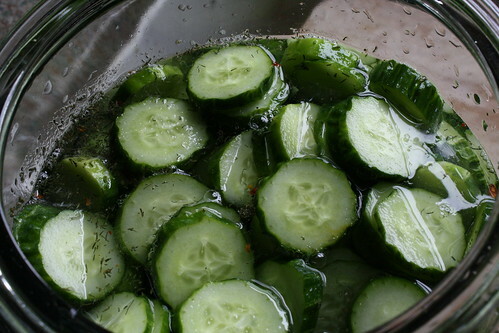 Related – one gallon of water will not fit into a one-gallon jar with three pounds of cucumbers in it. My turkey baster saw its first use in years as I siphoned off the overflow. In the end, nobody died and all slices were submerged. And then I took a bunch of gratuitous dill pickle pictures, the majority of which I will spare you. The jar needs to sit in a cool, dry place for at least three days, after which time I am to scrape off any scum that has accumulated. Mm, doesn’t that sound delicious? This gave me the impetus to clean out the paper plates and plastic silverware left by the home’s previous owners (yes, who moved out a year ago) in my kombucha cabinet. Next up: What happens when I move along to the next step of the bread and butters – scintillating!